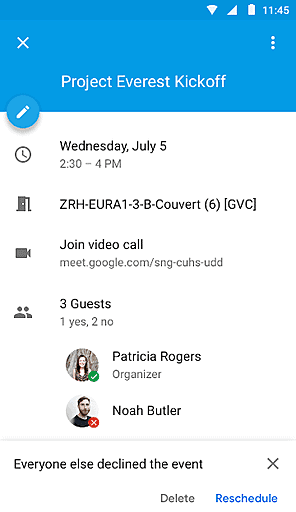 The Google Calendar app for Android has just received a new feature, and it lets you know when everyone declines an event which you’ve created. This feature mate it to G Suite users not long ago, and it’s now available to everyone, as long as you have the app installed, and the change has been included in the official changelog as well. The app will notify you when everyone rejects an invitation to your event in the form of an exclamation mark, and you can check out how that looks like in gallery down below. After you receive such a notification, you will have three options at your disposal, you will be able to cancel the event entirely, reschedule it, or dismiss the notification. Do keep in mind that not everyone who has Google Calendar installed has this feature yet, you need to receive an update for the app and update it in order to get it, and the change will be reflected in the changelog in the Google Play store, as already mentioned. It seems like that is the only change that the new update brings to the table, though. 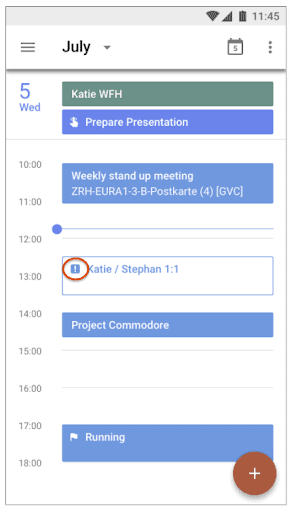 It has been a while since Google Calendar received an update which actually brought a new feature to the table, at least as far as regular Google Calendar app is concerned, we’re not talking about G Suite users here, of course, as such features usually land for G Suite users first, as did this one. A ton of Android users are using the Google Calendar app, as it’s one of the most popular calendar applications for Android. The app currently holds a 4.2-star rating in the Play Store, and as all of you know, the app itself has been around for a long time at this point. If you’d like to know more about Google Calendar or download / update the app, click the banner down below. The post Google Calendar Updated With ‘Everyone Declined Indication’ appeared first on AndroidHeadlines.com |.